Want to extend your summer nights? We have the most FUNtastic way to do just that! 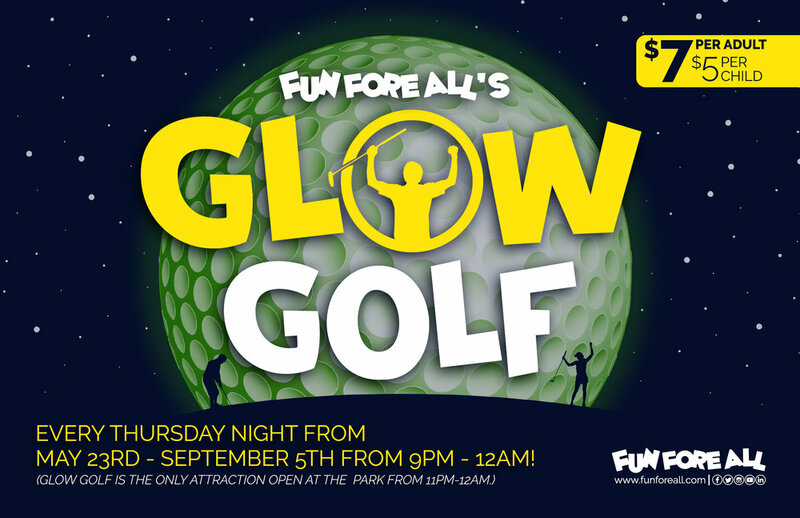 EVERY THURSDAY this summer (May 23rd-September 5th), we will be hosting GLOW GOLF! Head out to Fun Fore All Family Fun Park for a round of miniature golf like you have never experienced before - Glow Golf! We will be lighting up (black light and glowing golf balls) eighteen (18) holes from our award-winning miniature golf courses. Whether you are looking for an exciting family escape or a uniquely entertaining night out, you'll find fun on our glowing miniature fairways! NOTE: Glow Golf is the ONLY attraction open at the park from 11PM-12AM.